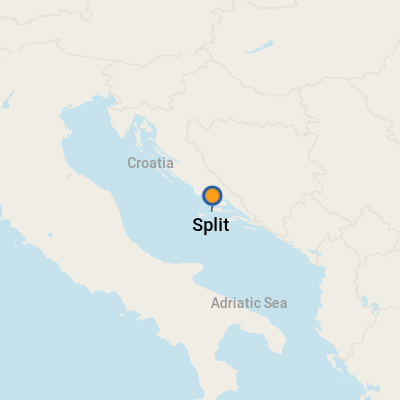 Split is a very easy port to navigate; simply turn left outside the shipping terminal and you can walk into town along the Riva (the harbor-front promenade), or head right (up the hill) and then left for Diocletian's Palace. The area around the port caters well to young travelers, with plenty of cheap and cheerful cafes, exchange bureaus and Internet centers. Head a little up the hill opposite the terminal and you'll find a street market selling beach towels, hats, sunglasses, newspapers and other tourist paraphernalia. But the main action is to your left, in the Old Town and around the palace. 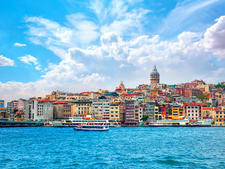 The waterfront and streets around the palace are often thronged by tourists, so be prepared for crowds. Taxi fares can vary. Be sure to agree on the rate in advance and check any "extras." 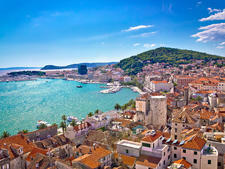 Diocletian's Palace and the Old Town are within easy walking distance of the dock. If you want to venture farther afield, you'll find a well-served taxi stand right outside the passenger terminal and a bus station to your left. Look right, across the road, and you'll see a tourist information center; there's also a post office and a place to leave luggage. 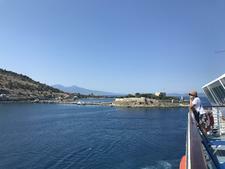 Stroll along the harbor front and you'll see ferries offering trips to Korcula, Hvar and Dubrovnik. The locals speak Croatian among themselves, but fortunately for tourists, most also speak English. Basic phrases worth knowing include "Dobro jutro/Dobra vecer" ("Good morning/Good evening"), "molim/hvala" ("please/thank you") and "Racun, molim" ("The bill, please"). In an emergency, dial 112 or call 192 for the police, 193 for the fire brigade or 194 for an ambulance. Croatian food has a strong Italian influence, so pizza- and pasta-lovers will find lots to enjoy in Split. Truffles are a big delicacy here; fuzi s tartufima (pasta in a tasty truffle sauce) is a popular dish. Locally sourced fish, along with mussels, oysters, prawns and squid, form the basis of many dishes, such as brodet, a rich fish stew usually served with rice polenta. Seafood not your thing? Try beef, lamb or chicken peka, a delicious dish in which the meat is cooked on hot coals underneath a bell jar of sorts to keep it succulent. Or try pasticada, a luscious beef casserole best served with gnocchi. For a snacky lunch, prsut (Croatia's version of prosciutto) and paski sir (a sturdy sheep's cheese from the island of Pag) are a good combination with crusty bread and salad, as are cevapcici (thin, sausage-style minced-meat kebabs). Or give burek -- a tasty pastry filled with minced meat, cheese and spinach -- a whirl. (Many local dishes originated in the Middle East, another of Croatia's key culinary influences). As for dessert, leave room for fritule (little fruit-flavored doughnuts) or a slice of kremsnita, a heavenly cake made with creamy vanilla custard. Restaurants abound in Split, so if you're feeling adventurous, your best bet is simply to head for the Old Town, look at a few menus and follow your nose. Foodies might enjoy a slab of Croatian fig cake, which comes in lavender, orange and almond flavors. Alternatively, try a jar of fig jam or chutney. Figs are big here. So, too, are almonds, and little bags of locally grown nuts, coated in pastel-tinted icing, make good presents. Other cheap and cheerful mementos include locally made apricot biscuits and praline chocolate. For something more lasting, check out Split's many jewelry stores or the stalls at the entrance to Diocletian's Palace, which feature small sculptures, clocks and dishes made from white Dalmatian marble. The Dalmatian coast produces some fine wines; try Plavac Mali from the Peljesac Peninsula if red is your preference, or Posip from the area around Korcula if you enjoy white wine. If beer (known locally as "pivo") is your tipple, you'll be spoiled by the choices; try Karlovacko (which, not surprisingly, hails from Karlovac). Or for a real taste of Croatian history, sip a glass of Osjecko, Croatia's oldest beer, first brewed in 1697.